When choosing a seed variety, farmers may consider maturity, standability, pest resistance and yield. Many farmers also may opt for a seed with higher protein content because it can increase soybean demand and value. This is because higher protein levels mean greater demand for soy in animal feed. This can in turn, increase the price a farmer gets per bushel. It is also important to consider seed treatment like those treated with fungicides and insecticides. Depending on the location within Missouri, seed variety and weather, farmers usually plant soybeans somewhere between late April and early July. Farmers consider many different factors when planting including the depth at which the seed is planted and the width between rows. Soybean are most often planted using a planter or a drill that is pulled by a tractor. Scouting fields early on and frequently is a great way to combat weeds, pests and diseases. A farmer cannot know how to treat a field unless he or she knows what the challenges are. The soybean checkoff also funds research and creates tools to help you identify, manage and defend your soybean fields from yield-robbing diseases and pests. To order a Plant Disease & Pest Management Guide or a Soybean Diagnostic Guide, click here. Seed – This is planted in the ground and emerges from the soil in the form of cotyledon leaves. Stem – This provides support for the growth of the plant and transports nutrients from the roots to the leaves. Leaves – They have one set of cotyledons, one set of unifoliate leaves and many sets of trifoliate leaves. Roots – They have a taproot system to provide stability and fibrous roots extending out to bring in nutrients. Flowers – Their flower is usually purple, pink or white and is on the stem and branches. Pods – This holds and protects the soybeans produced by the plant. Harvesting soybeans usually occurs from September through November. During this time, the fields turn from green, to brown. A combine is used to harvest the soybeans. The combine stores up the beans and discards the rest of the plant. The target harvest moisture for soybeans is 13 percent. The moisture of the beans can be checked using a moisture analyzer. After harvest, beans are stored in elevators owned either by farmer’s themselves, co-ops or grain merchandising companies. Missouri soybean are transported by truck, train and barge. About 55 percent are transported by truck, 24 percent by rail and 20 percent by barge. Soybean are transported within the state, across the U.S. and around the world. 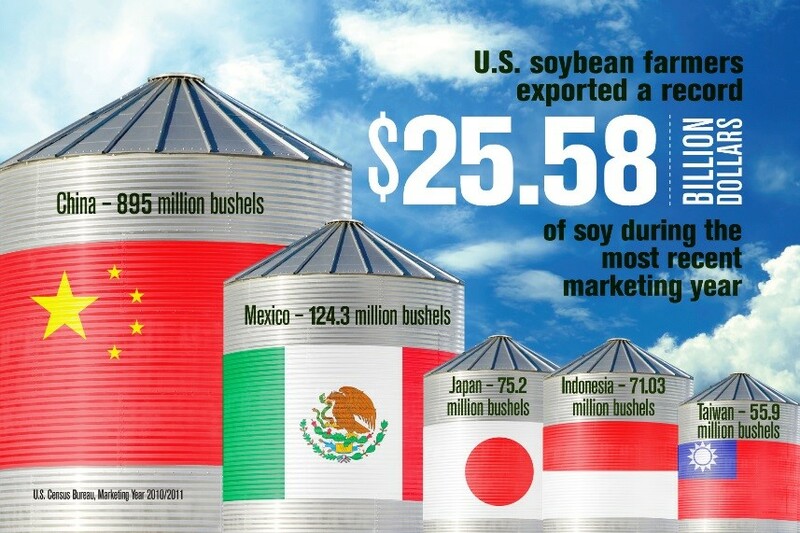 The U.S. exports the largest portion of its soybean to China. The University of Missouri Cooperative Extension Service and the USDA National Agricultural Statistics Service provide a wide range of data and tools for growers. Explore MU Extension fact sheets online at extension.missouri.edu. 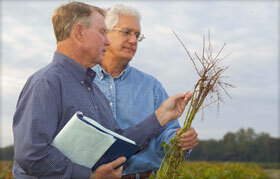 Find a full list of USDA crop progress reports and other details online at www.nass.usda.gov.